Book Launch for Michael Brendan Dougherty's "My Father Left Me Ireland"
May 15, 7:30 – 10:30 p.m. The University Bookman is a co-sponsor of this book conversation event. Schedule, speakers, and registration can be found here. June 22, 2 – 8 p.m.
General audience. Registration information available here. March 28, 6:00 p.m. – 8:00 p.m.
James Matthew Wilson is Associate Professor of Religion and Literature at Villanova University and Poetry Editor for Modern Age. October 3, 4:00 – 5:30 p.m.
Panelists: Ted McAllister, Professor of Public Policy, Pepperdine University; Samuel Gregg, Director of Research, Acton Institute; Daniel McCarthy, editor, Modern Age. Moderator: Ryan Streeter, Director of Policy Studies, AEI. October 19, 6:30 – 9:00 p.m.
“Civil Discourse in a Time of Political Polarization"
Speakers: Dr. Elizabeth Corey, Baylor University, and Dr. Michael Federici, Middle Tennessee State University. Hosted by Markets & Morality and the Tocqueville Forum; cosponsored by Kirk on Campus. Winants Auditorium in Graves Hall, Hope College. "The Crisis of Liberalism: Christianity and Politics in the 21st Century"
November 6, 5:30 – 7:00 p.m.
Lecture by Patrick Deneen, author of Why Liberalism Failed and Professor of Political Science at the University of Notre Dame. Response by Vincent Phillip Muñoz, Tocqueville Associate Professor of Religion & Public Life in the Department of Political Science at the University of Notre Dame. Co-sponsored by The University Bookman, Portsmouth Institute, and the Morningside Institute. New York Athletic Club (180 Central Park S., New York, NY 10019; NYAC dress code required). November 13, 5:30 – 7:30 p.m.
Panelists: John O’Sullivan, editor-at-large of National Review, Gerald Russello, editor of The University Bookman, and Daniel McCarthy, editor of Modern Age. As a historical note, Dr. Kirk wrote a column on education for 25 years for National Review, and founded both The University Bookman and Modern Age, journals which continue to flourish today. Co-sponsored by National Review Institute. C-SPAN to film. New York City Union League Club (38 East 37th Street, New York, NY 10016). November 15, 7:00 – 9:00 p.m. Speakers: John O’Sullivan, editor-at-large of National Review, the Rev. Robert Sirico, president of the Acton Institute, and Dr. Jeff Polet, professor of political science at Hope College. Moderator: Kathryn Jean Lopez, Senior Fellow at National Review Institute. Co-sponsored by Hope College Political Science Department, National Review Institute, and the Acton Institute. Keynote speaker Wilfred McClay, Chair in the History of Liberty at the University of Oklahoma; open panel session on selected texts. 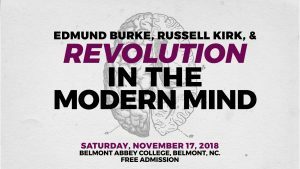 Please see our Edmund Burke Society homepage for the full conference program and registration sign-up.